SP Flash tool is an application you could find very useful in fixing extreme cases of a bricked MTK Android (e.g Tecno, Gionee, Infinix, Opsson, Innjoo etc) like the phone not coming on at all or not booting into recovery mode etc. It is used to flash recovery, Roms, unbrick MTK Devices. Warning! Do Not format unless you have the stock ROM for your exact phone model. 15. Ensure to do a factory reset in recovery mode to clear any errors. 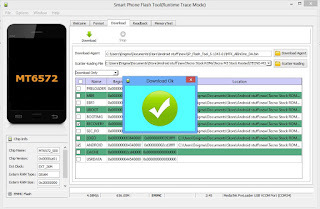 You have successfully unbricked your Mtn Device or flashed a TWRP recovery into your Mediatek Device. If you experience any problems or errors, ask using the comment box.